Details of one report into Savita Halappanavar’s death point to medical mistakes and legal issues. 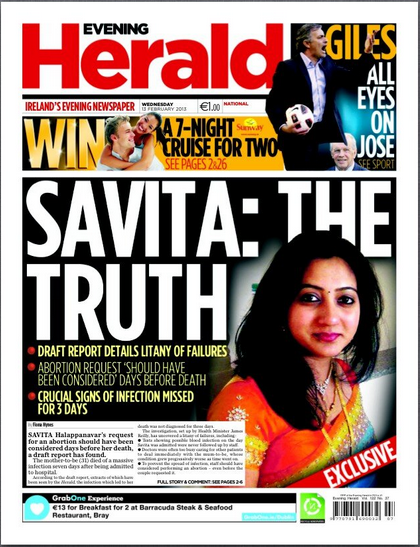 Last Wednesday, the Evening Herald published leaked details of the Health Services Executive investigation into the death of Savita Halappanavar in University Hospital Galway last October. Front page of the Evening Herald, 13th Feb 2013. This investigation, whose panel was composed of international and Irish experts, was lead by chairman Professor Sir Sabaratnam Arulkumaran from the University of London (NB: in the UK abortion is legal and termination of Savita’s pregnancy would have been routine). Praveen, Savita’s husband, was unhappy with this investigation at the time it was set up and did not co-operate with it. … there was a lack of clarity among key staff on who was responsible for acting on the blood test results. Different staff members told the probe it was not their responsibility to follow up the test results. …there was an over-emphasis on the need not to intervene until the fetal heart had stopped beating, together with an under-emphasis on the need to focus attention on the monitoring and managing of Savita for the risk of infection. So how was it leaked? The report had been sent out to hospital staff members in order to give them the right of reply before the full publication. 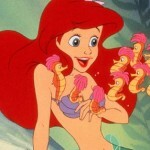 It is implied that one of these people perhaps leaked the report to journalists. The government has insisted that they themselves have not seen the full report and that the first person to do so will be Praveen Halappanavar. Minister for Health James Reilly has said he expects to see it before the end of February and will not be officially commenting until he does; however, the responsibility for publication rests with the HSE. He’s very down, distressed and very upset. He just feels he and Savita have been very badly treated again, that this simply should not have happened and that he and Savita’s family have been treated with total disrespect all the way through. Here he is listening to the report into his wife’s death being bandied about on the public airwaves and he hadn’t even had a chance to look at it. – Gerry O’Donnell, Praveen’s solicitor. The suggestion seems to be that medical negligence was a contributory factor but that in addition there are no clear guidelines here and that doctors felt that their hands were tied. – Minister for Communications, Pat Rabbitte. Certainly, anti-choice organisations would not agree that a termination should have been performed as early as possible to give Savita the best chance (i.e. : the international standard of care). The hospital’s internal inquiry, which despite calls at the time the story broke, has not been publicly released. The HIQA investigation, which is ongoing and not expected to be published soon. The legal inquest, which is due to begin on the 8th of April in Galway. The government’s abortion legislation gives force to the X-case, which has had to be introduced in line with the European Court of Human Rights 2010 judgement and is not directly related to Savita’s death, is still in draft form and needs to be brought to Cabinet before going to the DÃ¡il and Seanad. Some bright spark even wrote to the Irish Times to suggest that instead of X-case legislation (which is 21 years overdue), what we really need to do is put suicidal pregnant women on 24-hour suicide watch against their will. Women in Ireland in Savita’s situation today – women with life-threatening pregnancies – still have no more legal protection for their right to life than she did.